Happy back-to-school season! We hope the academic year is off to a terrific start and are excited to support you with new readings, streaming video, lesson ideas, webinars, and other opportunities for professional development. As you explore our website you might wonder where to find all of these new resources. Well, consider this blog post your “cheat sheet”! Below, we’ll answer some questions you might have. If you’ve got additional questions about our resources or website, or ideas for posts you’d like to see us publish in future, comment below! How do I borrow resources from Facing History’s Lending Library? If you are a trained educator (an educator that has gone through one of Facing History’s qualifying in-person or online professional development opportunities)in our Educator Network and live in North America, then you can borrow books, videos, and poster sets from our Lending Library, free of charge. 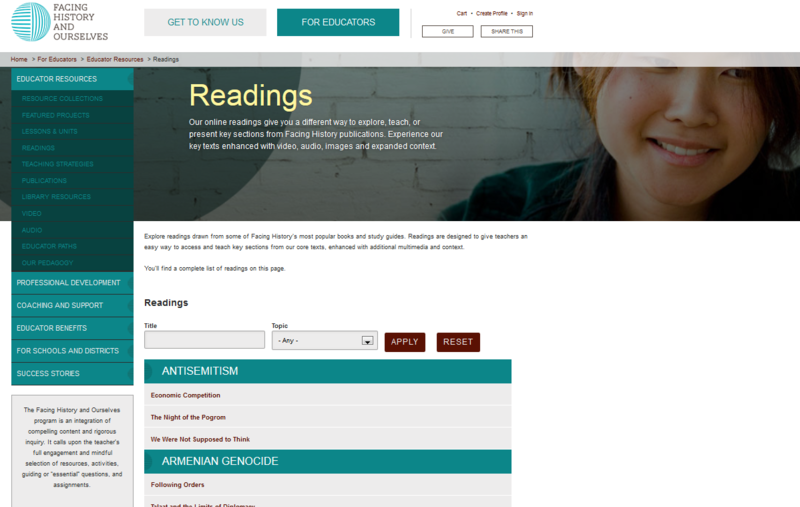 Simply log into facinghistory.org and add the resources you’d like to borrow to your shopping cart, much like shopping online. If this is the first time you’ve borrowed from us you will be asked to submit credit card information, but rest assured that you will not be charged unless we never receive the resources back. Once you’ve “checked out,” we well send your resources to you, postage paid, and we’ll even include a return label so you can send the resources back with no cost to you. Not a trained Facing History educator? Sign up for one of our courses today! How does Facing History address current events? From the disturbing lessons of the Holocaust and other genocides to struggles for civil rights from Birmingham to South Africa, Facing History helps educators, students, and the general public wrestle with complex moments in human history the world over, and works to help them understand the range of human behavior. Many of our resources, teaching strategies, and publications can help teachers address current events in the classroom. You might check out our resource Teaching “Reporter,”to explore essential questions about being a global citizen in a digital age in which we are constantly confronted with news and information. Our series of “Neighborhood to Neighborhood” blog posts provides ideas, questions, and tools for starting digital storytelling projects in your classroom in which students can report on the current events and issues that matter to them. You can also keep up to date with Facing History on our blogs, or through Facebook, Twitter, LinkedIn, or Instagram, where we often post everything from the latest news about new resources and professional development opportunities, to ideas for contextualizing events and discussions taking place around the world today. How do I search for streaming video? Facing History’s video collection includes insights from top scholars, the voices and memories of witnesses to history, and inspiring stories from teachers and students who wrestle with the complex questions of history in today’s classrooms. Find what you’re looking for on our streaming video page. You can also find ideas for incorporating streaming video into your classroom as part of a flipped classroom exercise on our blog. Where can I find information about upcoming professional development opportunities? New to Facing History? Or maybe you’ve used or resources, gone to one of our community events, or taken a professional development workshop, seminar, webinar, or online course with us? Whether you’re a returning visitor or a new friend, take a moment to check out the full calendar of offerings we offer in-person and online over the course of the year. Our offerings introduce humanities educators to innovative teaching strategies, resources, and scholarship that make teachers more effective and lead to increased student engagement and learning. You can filter by location here and search for online-only options. Does Facing History offer alternative versions (audio and video) of readings for differentiated instruction? We do! Check out our audio resources page. What is a Facing History “lesson idea”? What is a Facing History “teaching strategy”? A Facing History lesson idea gives an educator a general overview and structure of a lesson, following the Facing History scope and sequence, with room for you to improvise and tweak as necessary for your students. A teaching strategy is exactly that, a strategy you can use in your teaching to nurture a variety of literacy and critical thinking skills. Over the course of the year, Facing History hosts a regular series of free webinars that explore key Facing History themes and topics, including civil rights, the Holocaust, immigration, creating safe schools, and more. Register for an upcoming Facing History webinar today! You can also explore recordings of past webinars, many of which feature special guests such as award-winning authors and filmmakers, Holocaust survivors, and veterans of the American civil rights movement here.